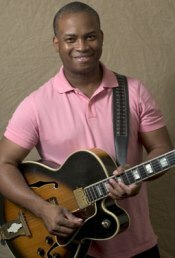 Born in 1963 in Albany, Georgia, Russell Malone grew up influenced by the deep spirituals of his childhood chruch environment. He received his first guitar - "a green plastic four-string" - at the age of four. A major turning point came when he saw B.B. King play "How Blue Can You Get" on the popular '70s TV show "Sanford and Son". That experience led him to listen to more blues, country music, and jazz, and artists like Chet Atkins, Johnny Cash, Wes Montgomery and George Benson. A self-taught player, he progressed well enough to land a gig with master organist Jimmy Smith when he was 25. After two years with Smith, he hooked up with Harry Connick Jr. and his orchestra, a position he held from 1990-94. He became a household name when he joined the phenomenal singer Diana Krall, recording the now-classic albums All for You and Love Scenes and touring the world with her. One of the best bop- and blues-oriented guitarists operating today, his latest albums are Playground and Live at Jazz Standard, Vol. 1 from MaxJazz.